Place wine and garlic into sauté pan large enough to accommodate lobster tails. Bring to simmer over medium heat. Add lobster tails, cover and allow to steam for 8 to 10 minutes until shells curl and lobster meat turns white. Remove lobster tails with tongs and transfer to a cutting board. Allow to cool for 15 minutes. Using kitchen shears or sharp knife, cut through top shell lengthwise. Remove meat and cut into 1/2-inch pieces. Set aside. Add lobster shells, remaining wine and chicken stock to a large saucepan and bring to boil. Reduce heat to low, and keep warm. After 5-10 minutes, remove lobster shells from stock. Meanwhile, in another large heavy saucepan, melt 4 tablespoons of butter over medium heat. Cook until butter begins to foam and turns brown, 2-3 minutes. Take care not to let it burn. Add leek and shallots, along with good pinch of salt, and cook, stirring frequently, for about 4 minutes, or until vegetables begin to soften. Add rosemary and rice and stir until lightly toasted, 3 to 4 minutes. Add brandy to rice, stirring constantly until it is absorbed completely. Then add chicken stock, one cup at a time, stirring constantly. Continue adding stock just until rice is tender and creamy but still offers a bit of resistance when you bite into grain. This will take about 20 minutes. You may have some stock left over. 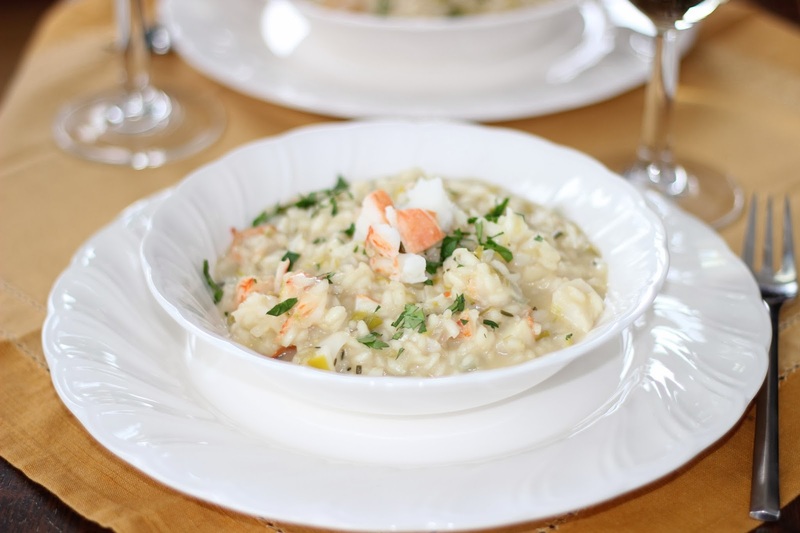 When rice is cooked, remove from heat and gently fold in chunks of lobster along with Mascarpone and lemon zest. Serve in bowls, garnished with parsley.